The scouts have found us. This evening there were at least half a dozen around the entrance to both bait hives. Yes, that's bait hives plural now...I set up a second one. The new bait hive is a nucleus box, near the back door by the path to the terrace and garage - I put it there so that I'd see it a lot and could easily monitor it for scout bees. With scout bees now thronging round it, it must be admitted that it's not the ideal location for a busy hive, as the bees' flight path is directly across the route to the terrace and the garage. 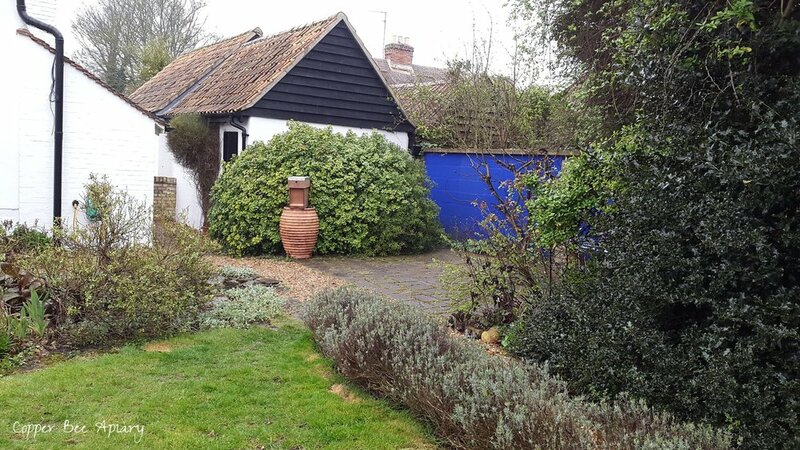 When we moved to this bigger garden, my husband declared with relief that we would no longer have to step into the line of fire when going out the back door, as the beehives could all be kept at the far end of the garden. So...I guess there's a conversation we'll be having when he reads this post. Anyway, the bees may not move in. This nucleus box is a bit on the small side - the original bait hive that I set up is a better prospect. And their current beekeeper (assuming they are from a local managed colony) is likely to thwart their swarming plans in any case. The original bait hive and the new one seem to be attracting similar levels of interest from the scouts. Both had sat apparently un-noticed for some time until today. Possibly the addition of the old brood combs a couple of days ago is what brought in the crowds. It worked! The bees came!